This is a list of pre-release and unused content for the game Super Mario 64. 32 courses were initially planned for the game, but only 15 of them made it into the final product. In some sketch-ups of the game's early development in Super Mario History, Mario is seen jumping on a piano with the phrase ピアノの上をあるく (Walk atop a piano). He is also seen climbing a ladder, swinging around a pole, and pushing a door and a block of ice. The crouching trip kick ( + ), present in the final game, was intended to be for attacking short/small enemies, but the developers never added any enemies that were specifically targeted by that move. During an interview between Satoru Iwata and Shigeru Miyamoto regarding New Super Mario Bros. Wii, Iwata stated that there used to be a multiplayer function that was scrapped from Super Mario 64, likely due to hardware limitations. It was also stated that one could see Mario and Luigi meet in the corridor. This, apparently, inspired the multiplayer function of New Super Mario Bros. Wii. Iwata: Ever since Mario Bros., you've had your heart set on making a multiplayer Mario game. You've tried each time, but it's never quite come together… Even with Mario 64, it started with Mario and Luigi running around together, didn't it? Miyamoto: That's right. The screen was split and they went into the castle separately. When they meet in the corridor, I was incredibly happy! (laughs) Then there was also the mode where the camera is fixed and we see Mario running away, steadily getting smaller and smaller. In an interview between Iwata and Koichi Hayashida regarding Super Mario 3D Land, it was mentioned during a discussion about the Flagpole that it was once considered to be incorporated into Super Mario 64. Iwata: The impression the goal pole makes has a big influence over the impression that the game makes. I suppose he thought this was an area that deserved effort. Hayashida: Later, I asked (Yoshiaki) Koizumi-san, and he said that they tried a goal pole once for Super Mario 64. Iwata: Oh, is that so. Hayashida: But at the time, when they thought about what was the most fun about playing in 3D, it was going to all sorts of places and looking for something, so they decided on players getting a Star. According to Yoshiaki Koizumi, Luigi was dropped from the game because technical limitations prevented from having both him and more elaborate levels. Koizumi: This may not be a direct answer, but personally, when we made Super Mario Galaxy, I had regrets about some things. I was able to do those things in Super Mario 3D World. Koizumi: One goes all the way back to Super Mario 64. When we made the first prototype, Mario and Luigi were on a flat field. Koizumi: Yes. We ran it that way, but when we made the landforms, because of hardware limitations we had a choice between cutting Luigi or making less elaborate landforms. Then, in tears, we had to ask Luigi to leave. The team eventually decided to put Luigi in a Mario Bros. type minigame instead, but the fact that the N64 would be sold with only one controller factored into his total removal by February 1996. After the game's release, rumors started to circulate about how to unlock Luigi; however, these were all proven false. An early screenshot showing the unused Boo key. Mario was originally voiced differently, possessing a screechy, childlike voice rather than his current Italian accent. Bowser sounded more tiger-like. Big Boo held a key instead of a Power Star inside him. The purpose of the keys were to unlock a variety of the various doors in Big Boo's Haunt; there was even a "key counter". The upgraded Triple Jump Mario receives after talking to Yoshi in the final game is the same animation used for when Mario enters any level in earlier builds. Jolly Roger Bay used to have music that is similar to the one used in the final game. Also, the sunken ship was much different in the E3 trailer, as it was more modern, had a bridge and a funnel, and was white. The water was very white also. Mario's Triple Jump resembled Luigi's backward somersault in Super Mario 64 DS. The Thwomp's grunt used to be a deep thunderous "thud". Bowser in the Dark World was only the arena where the player fought Bowser. Blargg was planned to be in the game with its Super Mario World design and was loaded but not placed in Lethal Lava Land, Bowser in the Fire Sea, Wing Mario over the Rainbow. It has only one animation (in which it jumps out of lava) and its textures are unfinished, meaning it was likely scrapped early in development. Originally, if Mario were to not get on the wooden part of the slide in Tall, Tall Mountain, he wouldn't be led to a dead end, but instead further down a slope that wasn't present in the final game. Whomps had a more simplistic design, having a design similar to Thwomps, but with thick eyebrows. There was also a minimap, though the concept of displaying a map in-game would be passed down to its remake. Coins resembled how they appeared in past games rather than having a carving of a Star on them. When Bowser was defeated, he'd leave behind multiple coins and a Power Star. The former of the two is somewhat utilized as a visual effect when defeating Bowser in either Bowser in the Dark World or Bowser in the Fire Sea. Power Stars were two-dimensional, reflecting their design from Super Mario RPG: Legend of the Seven Stars, and the Scuttle Bug enemies were fully 3D and mahogany colored, and had bushy, angry eyebrows and beady pupils. Water mines (with graphics identical to spike bombs) were going to be in a water level. Yoshi Egg graphics are stored in the game's code, along with a yellow ! Switch. The presence of Yoshi Eggs implies that Yoshi was originally going to play a more prominent role in the game. There are some unused platforms in the game, such as a flat, checkered platform, resembling the two elevator platforms in Whomp's Fortress. This platform, however, does not do anything other than let Mario stand on it. Another unused platform is like the previous one, except it rotates after every couple of seconds. A cactus was found in the data for Shifting Sand Land, and frames of a flower can also be found in the Lethal Lava Land textures. It seems like both would have been used as background objects. Two early life counters were used: The first one includes a clock-like look, with a clock hand pointing at Mario's health. The second one is similar to the final counter, but it decreased clockwise instead of counter-clockwise. There is an unused HUD icon of the key which only exists in the Japanese version. It was replaced by a Ü in the European version and removed completely in the U.S. version. The small Chill Bully graphics were not used in the final game. There was originally going to be a Blargg, which is still in the game's data, that was to appear in the Lethal Lava Land, Bowser in the Fire Sea, and, although seemingly unneeded, Wing Mario Over the Rainbow. In the game, there are small and large Bullies, using two models; a Chill Bully appeared in Course 10: Snowman's Land. It too had a small and a large model, but only the large model was used. One texture in the game is found in Cool, Cool Mountain. It is much like the ice texture that is used, but it has cracks in it. The texture probably used to be covering the water hole where Mama Penguin is. 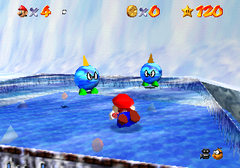 A variation was later used in the remake, as the texture for the breakable ice pond. In early footage, Bowser had blue eyes instead of red eyes. Also, VL-Tone, the creator of Toad's Tool 64 (a Super Mario 64 level editor), found textures of what looks like a red, black and white trampoline, with a yellow "?" painted on the side. It would most likely have had the same effects as its predecessors. There is unused text that may have been spoken by a Boo: "Eh he he... You're mine, now, hee hee! I'll pass right through this wall. Can you do that? Heh, heh, heh!" This dialogue was also unused in Super Mario 64 DS, with alternate translations. Some unused animations for Mario can be found in the game's code. This includes Mario quickly putting his hat on, bending his knees while riding a Green Shell, performing a flip while in freefall, putting one hand on his head and the other on his hip, a duplicate running animation, a static sitting pose that would've been used at the end of a Ground Pound, and an alternate version of the Side Somersault where Mario flips forward instead of sideways. Additional animations were planned, such as one where Mario would throw MIPS by the ears, but ultimately unimplemented due to time constraints. A debug function stored in the game is the "level select". In the menu, some of the courses have different names and some symbols can only be seen in the Japanese game (e.g. Whomp's Fortress is simply called "Mountain"). This unused flower was found in the graphics to Lethal Lava Land. An unused cactus found in the game's data. Possibly planned for Shifting Sand Land. Early screenshot of Super Mario 64. Also notice the early HUD. It seems to resemble Mario's head from Paper Mario. The unused Blargg found in the data. A screenshot of the early Penguin. A picture of the original Pokey graphics. A screenshot of the early Princess Peach's Castle. The text says "Welcome to Mario Wonderland. People who like adventures, go ahead to the castle right up ahead." Early version of Lethal Lava Land. Note that the Power Star had a similar design to those that appeared in Super Mario RPG: Legend of the Seven Stars, possibly a placeholder. Its texture is still in the ROM. The original, meaner looking Thwomp. Early version of Dire, Dire Docks. An early Bomp, with an early Whomp Fortress. Another early of the Whomp Fortress with a Bullet Bill. A smaller Chill Bully next to the one encountered in the final game. The replacing the key symbols. Unused Yoshi Egg displayed in-game. It still remains in the game's code. An early version of the Bowser fight. Notice the different HUD. The child-like voice clips of Mario heard in early footage are actually voice clips originating from the Warner Bros. SFX library. A pre-release screenshot is used on the Italian rear cover of Super Mario 64. It is evidenced by the HUD, presented in its early form. A pre-release screenshot is used on the board of the 2006 version of Nintendo Monopoly. This is evidenced by the colored number displays. 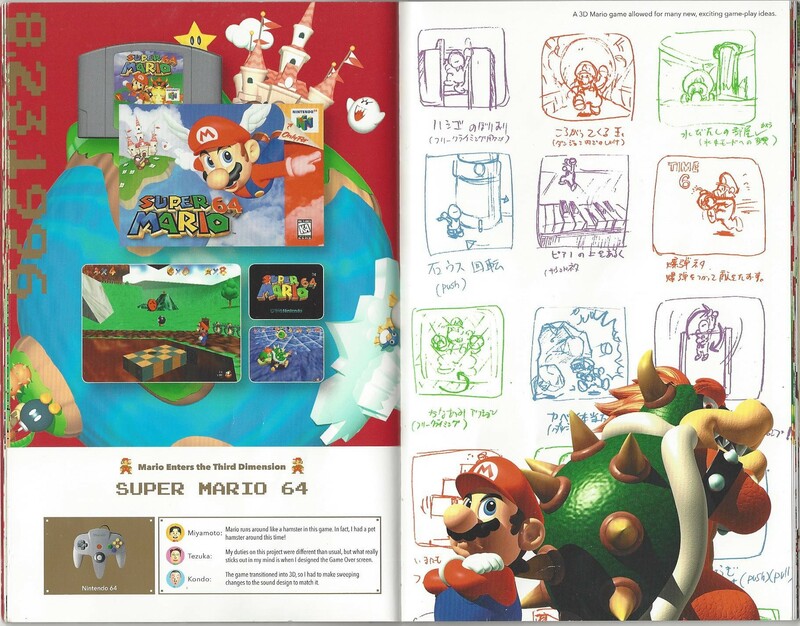 ↑ 4.0 4.1 "Super Mario 64 – 1996 Developer Interviews originally featured in the official strategy guides" shmuplations.com. Retrieved September 10, 2018. This page was last edited on March 8, 2019, at 20:58.